I'm on my way to go grocery shopping..ugh! But I wanted to post my card for yesterday's SCS sketch challenge before I go. I didn't decide to do this until about 9:30 last night and by then DH was working on the computer so I had to go from memory based on what I had seen at about 7:00 in the morning. I also decided that since it was so late. I didn't want to bring out the Cricut or the Cuttlebug or anything complicated. I was very inspired by the sample that was given with the sketch, so I decided to try a bit of brayering. You know brayering is a funny thing for me, it either works great or it looks horrendous. I think this one turned rather nicely if I do say so myself! I hope you like it as well. I will try to come back a bit later and post details if anyone is interested. Happy New Year! Enjoy your weekend everyone and I'll be back on Monday! Wow! Hard to believe it's the last week of the year for Mojo Monday. Everything seems to be returning to some sense of normalcy post Christmas, so I definitely wanted to make sure that I got a chance to play along with this week's sketch. It's quite simple really, so I don't think I'll bore you all with the details. I do wish I had a different color flower for the corner as I think this one was a bit too green for the color palette that I chose. I had one that was the right color; but it was too big, so in the end I went with this one. 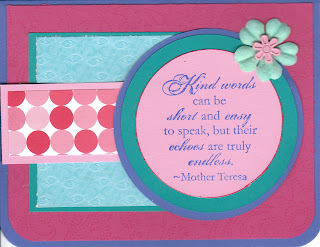 The sentiment is from the SU retired hostess set "Echoes of Kindness." 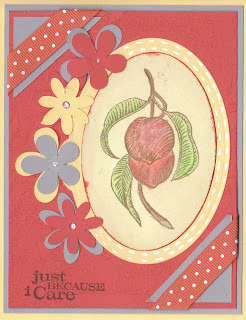 The Rose Red background is stamped with the "Stitched" Background stamp. The circles measure 3 1/4, 3 and 2 1/2 beginning with the Brilliant Blue one. Anyhow, that's all for me! Enjoy the rest of your day and I'll see you tomorrow! For today's card I decided to combine two challenges once again. It's been quite a while since I've been able to do a MMSC challenge. The sketch looked fairly safe and simple, so I decided to give it a whirl. 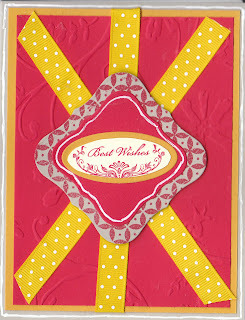 The card also meets the SCS color challenge today to use Sahara Sand, Crushed Curry and Real Red. Never thought that I'd use Curry as much as I have the last couple of days! Anyhow, this is what I came up with. 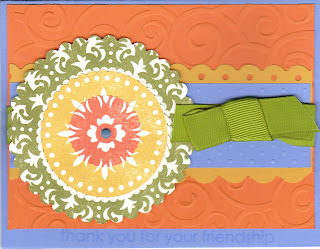 It's fairly simple, although I did have a difficult time trying to decide on the stamp I wanted to use in the middle. In the end, I chose to use the "Best Wishes" stamp from SU's Oval All set. The two squares in the middle are from the Curly Labels 1 Nestabilities set. One cut out in Sahara Sand and then the next layer cut out in Real Red. The pattern on the Sahara Sand piece is from Martha Stewart. The card base is actually Sahara Sand, though it's hard to tell by the picture. That's it for me, I hope you like it. I'm going to try to post again tomorrow; but not sure if I'm going to be able to. If not, have a Merry Christmas and I'll be back for sure on Monday. Just a quick post this morning. I'm heading out the door to take Jonathan to pre-school. 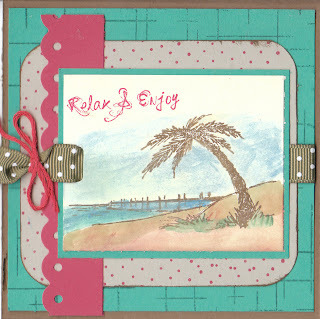 This is a quick card that I did yesterday for Wednesday's SCS sketch challenge. I also combined it with an SCS color challenge. I think it was this week's but I don't remember. 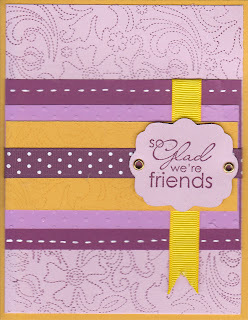 I used Barely Banana as my base and stamped it with the Crosshatch background stamp in Banana ink. Next I added a layer of Artichoke Print Patterns paper also from SU. The panel on the left is Going Grey and I ran a piece of Razzleberry ribbon down the center. The pattern paper behind the sentiment is the backside of the Artichoke paper. 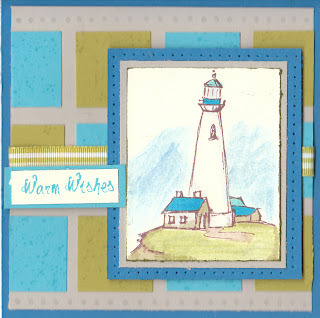 The focal image is from Coastal Wishes by Our Craft Lounge. I stamped it with Color Box Charcoal chalk ink and then used a variety of Copics, blender pens, aqua painters, inks and water color crayons to color the image in. I added some color around the edges by running them along a Color Box Dune Chalk ink pad. I mounted the image on to a piece of Barely Banana and then onto a piece of Razzlin Razzleberry. So, off I go! I hope to visit some of you later. Until then, have a great day! Wow, it's been quite a while since I've posted, at least it seems like it to me! I'm sorry I've been so sporadic in sharing things with you. Such a busy time with the holidays. I did finally get done with my Christmas cards. Not everyone on my list will be getting a handmade card; but that's just the way it goes. I am happy to be doing something else now. The card I have today is for this week's Mojo Monday. I also combined it with a previous SCS color challenge that I had not done using Old Olive, Bermuda Bay and Pretty in Pink. 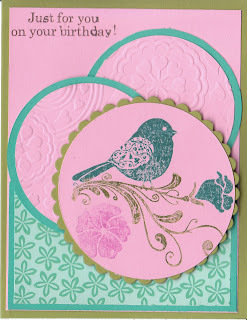 I started with a standard size Old Olive card and then added a 4 x 5 1/4 piece of Pretty in Pink. Next I added the Bermuda Bay with the strip of pattern paper at the bottom. The 2 Bermuda Bay circles in the background are 2 3/4. I cut 2 more pink circles each measuring 2 1/2. 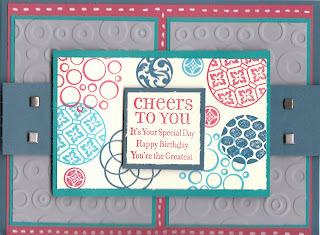 Then I ran those circles through the cuttlebug and embossed them. The main image is from SU's hostess set "Wings of Friendship." I inked the image with Bermuda Bay ink and then used a Qtip to remove some of the ink and then I went back over those areas with an Old Olive marker and a Pretty in Pink marker. 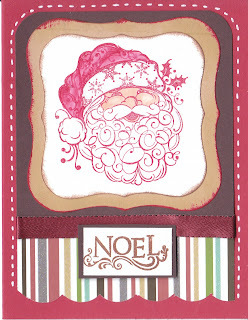 I stamped the image on Pretty in Pink paper and then used foam adhesive to attach it to the card. The sentiment in the corner is from SU's chitchat rubons. I had a hard time getting it to stay in place, so I had to doctor it a bit with a Chocolate Chip marker. I already have something done to share with you tomorrow, so I'll definitely be back tomorrow! Next week...who knows! I hope you have a great day and thanks for visiting with me! I'm here bright and early to post this morning, since I didn't get a chance to share anything yesterday. As you may realize by now, I am definitely focused on Christmas cards. I'm also not doing any challenges at the moment and probably won't again until after I get all my Christmas cards done. 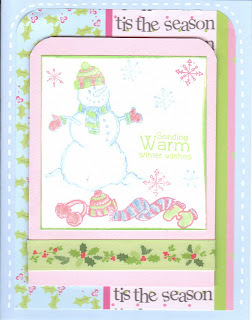 I'm sure that many of you are aware and have seen the holiday card series that Kristina Werner has been doing on her blog. Well, I decided to use a few of her cards from that series as inspiration for some of my own. 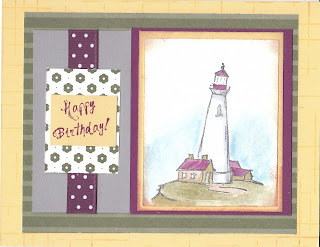 The card I shared yesterday was one example; and here is another one. 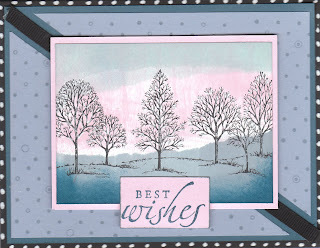 I was inspired by the fact that Kristina used pattern paper on this card as her focal image rather than stamping. 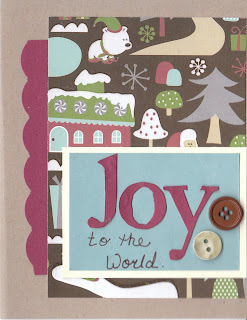 I pulled out my Merrymint collection of American Crafts paper and decided to used the fun neighborhood scenic piece. I stamped the letters from SU's Jumbo Outline Alphabet set on Burgundy paper and then glued them to a small piece of Baja Breeze. I hand wrote "to the world", which isn't as pretty as Kristina's; but then again I don't know anyone who writes as pretty as she does. Finally I added two simple buttons and the card was done.